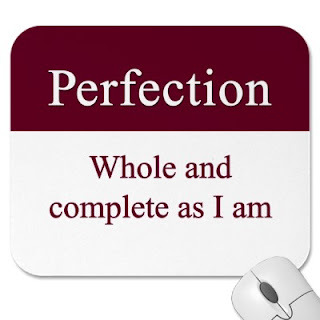 "You are perfect, whole, and complete - just the way you are, and just the way you are not." I hadn't been to her class in a while, so it was a refreshing reminder to hear these kind words. So much so, that I printed it up in a pretty purple font with a purple sun and hung it in the lady's room at work (after consulting with my only other female colleague, of course). We both talked for a moment about how important it is to see, read, and speak these truths to ourselves. Most of the time, we are talking to ourselves in such a way that we would never tolerate if anyone else spoke to us that way. We are quick to notice and judge ourselves for our shortcomings and mistakes, but are we as quick to acknowledge all of the things that we do right and what a blessing we are to others each day? Perhaps there are some words that lift, encourage, and remind you of the amazing being that you are underneath all of the "stuff" and labels that we live with every day. Consider taping up a sign somewhere where you'll see it frequently, and consider talking more kindly to yourself.